Versions of this simple dish are legion; from pilau rice and pilafs to rissottos and paellas - the list is almost endless. This recipe is quick, easy and delicious and can be used as an accompanyment to stir fries, fricassees, curries and stews. The choice of vegetables can be arbitary, but onions and garlic should always be used. Use whatever fresh or frozen vegetables you have to hand. Saffron adds a touch of luxury with its lovely yellow colour and delicate fragrance. 1 med onion, chopped finely. 2 cups of roughly chopped vegetables. I often use carrots, celery and cauliflower. 2 cups of dry, long grain rice. Basmati and Thai fragrant rice are best, but American long grain is good too. Try to avoid the quick-cook varieties - they taste awful. You can also use coarse cracked bulgur wheat for a nutty, Arabic taste. 3 cups of vegetable stock. Any combination of the following: Roasted cashews and pine kernels. Chopped fresh parsley, coriander or methi (fenugreek) leaves. Quartered hard-boiled eggs. Hot, flaked smoked haddock. Chopped spring onions. Dried fruit. Unsalted butter. Use a good quality heavy-based pan with a heavy, tight-fitting lid. Heat the oil until hot and add the onion and garlic. Stir and fry for a few seconds to relax the onion mix. Add the dry rice and stir to ensure all the rice is coated with oil. Add the chopped veg, stock and saffron, a pinch of salt and a twist of pepper. Cover with the lid and bring to a rapid boil, so that steam vapour escapes from beneath the lid. DO NOT REMOVE THE LID steam is needed to cook the rice properly. Removing the lid will ruin the dish. Reduce to a very low simmer for 5 minutes and turn the heat off completely; the rice will continue to cook in the retiring heat of the saucepan - so don't be tempted to peek under the lid! Allow to stand covered for 10 minutes before removing the lid. Stir to mix the ingredients. Decant to a suitable serving platter or dish, season and garnish. Serves 4. Cooking rice in the retiring heat of the pan has a wonderful effect on the texture of the finished rice; making it light and yielding in texture. Stir fry any combination of lean chicken, pork, beef or even chorizo in with the onions and garlic. Serve with a rich meaty gravy or a sweet chilli sauce. 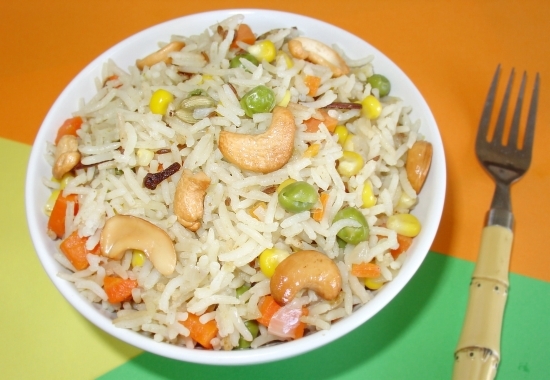 This dish is lovely when sprinkled with fried cashew nuts or toasted pine kernels.